Note: The coupon prints without any store names mentioned, so you should have no problem redeeming it. 2. Then change your zip code to 90210. 3. 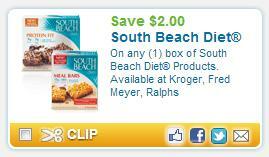 Click the “Coupons” tab and then the “Food” category. 4. Scroll and click “Show More Coupons” once. Continue scrolling and on the right column you should be able to spot and print the coupon above good for $2 off any one box of South Beach.